You are here: Home » HCG » HCG: Real Results or Another Fad? HCG: Real Results or Another Fad? It is interesting how a product that was first introduced in 1936, and has lived in virtual anonymity for 75 years, is now grabbing headlines. It looks like the HCG (Human chorionic gonadotrophin) craze is about to take off. According to Wikipedia, HCG is a glycoprotein homone produced during pregnancy that is made by the developing embryo after conception, and later by the syncytiotrophoblast (part of the placenta). 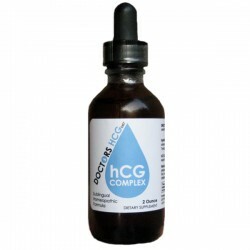 HCG is also produced in the pituitary gland of males and females of all ages. Dr. Mercola uses his proven marketing strategy, as he always does, when it comes discussing any newsworthy topic that he can relate to one of the products he sells. His strategy is to discuss a current event or health issue. He then he points out the dangers in order to make people feel uncomfortable so they feel the need to do something. Then, he lists the faults of competitive products before finally offering readers the magic bullet, which can be purchased with the easy click of a button. The strategy is simple and effective and has made him a fabulously rich man. Good for him. Dr. Mercola actually does a decent job of with his HCG article before turning it into another opportunity to flog his products to his legion of followers. He starts off by saying that the best ways to attack weight loss is with a combination of a good diet, and adequate exercise. I agree with him 100% on that point. He then talks about the fact that people have experienced remarkable success in losing weight and inches quickly with the HCG treatment and he provides reference articles that support the use of the product. He also provides references to articles and arguments that condemn the use of HCG. Ultimately, Mercola says he is not in support of the product as there has not been enough testing. Geez… this is coming from a guy that has made his reputation and a fortune selling alternative products. Anybody that reads this blog knows that I love to research and write about my findings. What people don’t know is that my wife Mary is that one that often inspires me to investigate new things. In fact, she got me hooked on ionized water, and she is the one who led me to investigate HCG. Mary is a beautiful woman, inside and out. At age 58 and post menopausal, she was struggling a bit with her figure (this is going to get me in a heap of trouble, but making up is so much fun). She is still stunning in my eyes and in the eyes of everyone that meets her, but she was definitely experiencing a few pounds and a couple of inches here and there that were driving her crazy. Pounds and inches are a deadly combination when it comes to the self esteem of a woman. Despite 54 years of research, I don’t know that I’m any closer to understanding women any more than the day I was born. Mary told me about the HCG and of course, I discouraged her from taking the product. Being a bit of a “gym rat”, I kept telling her to work out and to control her eating (this coming from a guy not exactly known for proper eating). I told her that going on a program for three weeks that involved a diet limited to 500 calories per day would be unhealthy. I reminded her that her BMR (basic metabolic rate) would drop and that her body would respond by partially shutting down as it would believe that it was starving. I indicated to her that I expected she would be hungry and would experience the negative symptoms of a starvation diet. I said she would likely be miserable and grumpy for the three weeks and I would have to find a girlfriend (which didn’t go over very well btw). Mary didn’t listen to me as usual and she started taking the HCG drops. I was prepared to hide in my home office for the duration. Mary lost 10% of her body weight in three weeks, as she dropped from 138.6 pounds to 124.2 pounds. She lost three inches on her hips, two and a half inches on her waist, two inches on her chest, arms, and legs. I would not have believed it if I didn’t witness it. What is more interesting to me is that instead of being hungry and miserable, she was happy and had lots of energy. Mary is an incredible cook and lover of food. She missed the savory smells and tastes, but she was not hungry. It gets better. In the two weeks since she has gone back to a 1,500 calorie per day diet, she has not gained back any weight or inches. She has been able to accept and adopt a new way and more healthy way of eating. Gone are the sugars and starches. I doubt I need to tell you this, but she is ridiculously happy (old clothes now fitting and a refreshing new self image). I have to tell you that I couldn’t have been more skeptical before Mary started her program. Of course, I jumped on the internet and read about how HCG didn’t provide anything more than a placebo effect and warnings. How could I not be skeptical? It wasn’t good enough for me to see Mary change the shape of her body in three weeks. I needed to actually see that she didn’t turn into a dragon lady during the process. I also wanted to see if the weight would go back on after she stopped the low calorie regimen. After seeing the results, I decided to try HCG myself. As I mentioned earlier, I’m a bit of a gym rat. I train about 6-8 hours per week. At the end of last summer, I weighed 188 pounds. After training pretty hard for the past 6 months, I actually gained ten pounds. I looked and felt a lot better, but there were stubborn parts (around the belly button and the love handles) that I just couldn’t conquer completely. At 54, I don’t expect a washboard stomach, but I had to wonder if I could do better. I started eating better when Mary went on her HCG regimen and I ended up dropping 5 pounds in 5 weeks, which made me pretty happy. I started the HCG regimen this past Monday. I found that I had a bit of a low grain headache for part of Monday, but other than that, no big deal. When I woke up Tuesday morning, I weighed myself and I was 189.6 pounds, which was a 3.4 pound weight loss. Hmmm. Rather remarkable, but it could have been due to a number of factors. Nonetheless, the loss provided enough encouragement for me to try it another day. Tuesday was actually pretty easy for me as I didn’t experience any negative side effects all day. Opening the fridge door was a bit of a challenge as a box of Twinkies kept calling me, but no real problems. I wasn’t hungry except when it had been several hours since I had taken the HCG drops. After taking the drops, the hunger quickly went away. Wednesday morning brought another weigh-in. I dropped another 3.4 pounds as the scale showed my weight was at 186.2 pounds. I weighed myself about four times as I didn’t believe it. Yesterday (Wednesday), was a bit more difficult for me. Mary was away most of the day babysitting our new granddaughter Emma and I was alone all day. I have always used food to combat boredom or stress and I didn’t have Mary around to support me, so it was a bit of a struggle, but not much. When I weighed myself Thursday morning, I weighed in at 184.0 pounds, which was another 2.2 pound loss. I couldn’t believe it, 9 pounds in three days, which represented almost 5% of my body weight. One thing that I have been doing, which I’m not supposed to do according to the regimen, is to continue going to the gym. That didn’t present a problem on Monday, or Tuesday, or Wednesday. However, I did find that my Body Blast class Thursday morning was really tough. I over heated much faster than usual and felt a bit light headed. I’m a big believer in “listening to my body”, so I cut out after 45 minutes instead of completing the full hour. I felt a bit drained afterward, but no more than usual. Everything was normal for the rest of the day and Mary and I enjoyed a nice 40 minute walk in the sunshine. I always drink a lot of water, but I have been drinking even more the past few days. Drinking water really does take the edge off a mild hunger. I don’t know what to say about HCG. I’m not a doctor, and I haven’t conducted any clinical tests. In fact, I know very little about HCG. I can say that the results have been dramatic for both Mary and me. I don’t know if the results are purely from a reduced calorie intake, or if the HCG actually helps the body burn off 3,000 to 4,000 of “surplus fat” per day as it claims. What I do know for sure is that taking the drops does suppress any hunger symptoms and the first four days on the program have been much easier than I anticipated. The only difference that I have noted during the past few days is that my body feels like it does after a good physical workout at the gym for several hours after I take the drops. It really bugs me when people like Dr. Mercola, who have the trust of so many people, make broad statements condemning something without trying it or investigating deeper. Dr. Mercola did the exact same thing with ionized water, without doing proper due diligence, and he created a serious downturn in an important industry. I will post daily reports in the next article. The opinions expressed in this article are those of the author and are not meant as medical advice. One Response to HCG: Real Results or Another Fad? HGG is stands for Human chorionic Gonadotropin. It is actually a natural hormone produced during pregnancy to help the baby get proper nutrients. Using method of HGG is also very simple. Just place the drops under your tongue. Hold the drops for 1 minute and no eating or drinking for 15 minutes.